Discover this dazzlingcontinent with the most incisive and entertaining guidebook on the market.Whether you plan to sample the street food at Paraguay's Mercado 4, spot agiant turtle in Ecuador's Gal pagos, or strut your stuff in Brazil's Carnavalparades, The Rough Guide to South... read full description below. Discover this dazzlingcontinent with the most incisive and entertaining guidebook on the market.Whether you plan to sample the street food at Paraguay's Mercado 4, spot agiant turtle in Ecuador's Gal pagos, or strut your stuff in Brazil's Carnavalparades, The Rough Guide to South America on a Budget will show you theideal places to sleep, eat, drink, shop and visit along the way - -withoutblowing your budget. - Independent, trusted reviews written with Rough Guides' trademark blend of humour, honesty and insight, to help you get the most out of your visit, with options to suit every budget. - Full-colour maps throughout - navigate Brasil a's airplane-shaped network or Cusco's ancient streets without needing to get online. - Stunning images - a rich collection of inspiring colour photography. 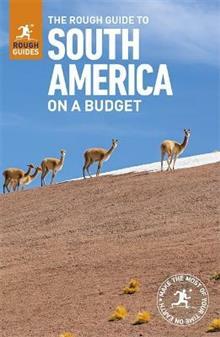 - Ideas - Rough Guides' rundown of SouthAmerica's best sights and experiences. - Itineraries - carefully planned routes to help you organize your trip. - Detailed regional coverage - whether off the beaten track or in more mainstream tourist destinations, this travel guide has in-depth practical advice for every step of the way. Areas covered include [10-15 areas]: Argentina; Bolivia; Brazil; Chile; Colombia; Ecuador; TheGuianas; Paraguay; Peru; Uruguay; Venezuela. Attractions include[5-10 attractions]: Ca n de Colca, Peru; Easter Island, Chile;Iguaz Falls, Argentina; Salar de Uyuni, Bolivia; The Amazon, Brazil; ThePantanal, Brazil; Kaieteur Falls, Guyana. - Basics - essential pre-departure practical information including getting there, local transport, accommodation, food and drink, health, the media, festivals, outdoor activities, culture and etiquette, and more. - Background information - a language section to help you get by in Spanish and Portuguese Make the Most of Your Time onEarth with The Rough Guide to South America on aBudget AboutRough Guides: Escapethe everyday with Rough Guides. We are a leading travel publisher known for our tell it like it is attitude, up-to-date content and great writing. Since1982, we've published books covering more than 120 destinations around theglobe, with an ever-growing series of ebooks, a range of beautiful, inspirational reference titles, and an award-winning website. We prideourselves on our accurate, honest and informed travel guides.